A real mix of stamps were used to produce this scene, which I shall also link up to Make My Monday where the challenge is to 'Create a Summer Scene'. I started by using a post-it note mask and sponging Pool Party into it to make a 'mountain'. The grass from Love and Sympathy was stamped over the bottom of the panel and the floral branch from Hopeful Thoughts at the top. 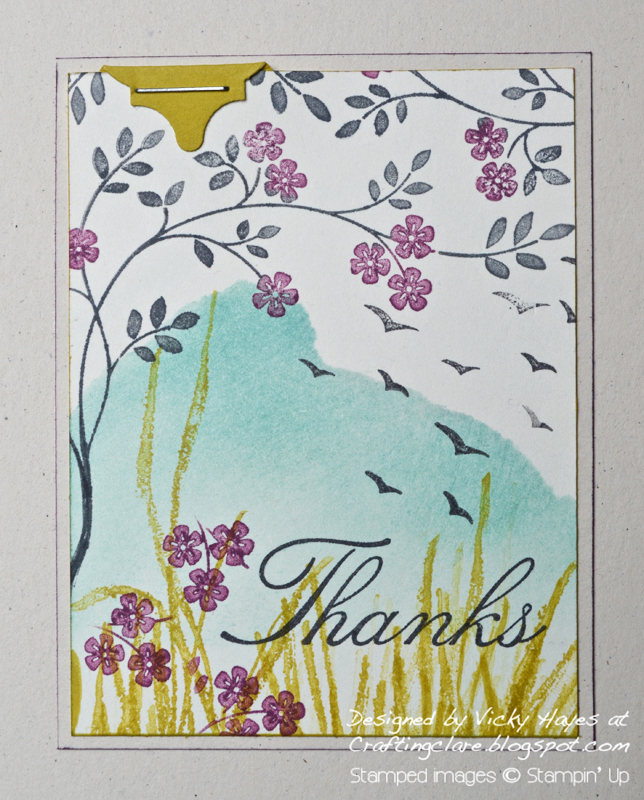 I used markers to ink up my stamps, substituting Rich Razzleberry for Orchid Opulence since I don't have it. 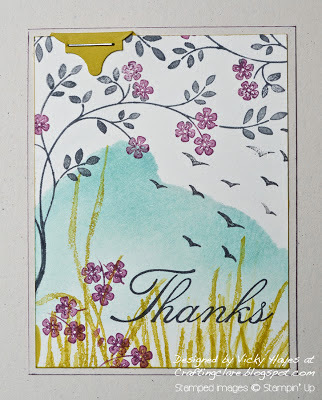 The colours needed balancing so I cleaned my Hopeful Thoughts stamp, inked up a group of flowers from it to sprinkle in the grass, and added birds from the retiring Up, Up and Away set. The sentiment is from a hostess set long since retired but still a big favourite of mine. To finish the card, I stapled a tab to the panel made with the new Mosaic punch (available 2nd July). Running a Summer starfruit marker round the edge of the stamped panel and a Rich Razzleberry one round the edge of its mat adds subtle dimension. There! And I feel positively wicked having that much fun when I should've been tackling my 'to do' list! • To make way for new items some of our favourites are retiring. Click the links to see STAMPS and ACCESSORIES available, while stocks last, until SUNDAY! My children have very kindly taken over washing up duties after my accident at the weekend (I sewed through my finger with the sewing machine - ouch!) so naturally they are eager to keep themselves up to date on the healing process! Yesterday at breakfast they asked how the finger was and I told them it was fine now. My youngest son sighed with relief. "That's good," he said. "Thank goodness you didn't sew through it with Big Belinda!" That transported me back to when he was tiny and used to 'tidy' my sewing box for a special treat - Big Belinda was the name he gave to my bodkin! Have a lovely weekend and I'll be back very soon with more crafting fun! Beautiful card Vicky, you have captured the inspiration photo perfectly. A gorgeous scene! Glad your finger is healing nicely. This is a wonderful scenic card. Pretty as a picture and lovely and summery. Perfect. 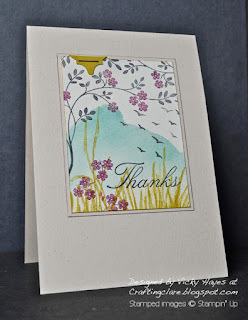 Your card is lovely Vicky, love the scene you created! Thanks for sharing your card at the colourQ, thanks for stopping by to see me as well! Happy Friday to you. A beautiful card. You have nailed not only the colours but the scene. It lead you to another perfect card, Vicky! How always blow me away with your works of art!! I'm glad to hear your finger has healed ... do be careful!! This has quite simply taken my breath away! Incredible! Loving your summery scene Vicky. Gorgeous colours. This is absolutely beautiful and a fantastic take on the colors this week! Eek Vicky, this is gorgeous! What a beautiful scene you created. 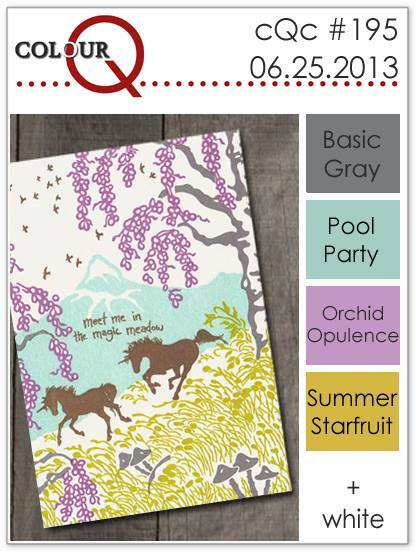 Thank you so much for sharing with us this week at the colourQ! What a beautiful card, I do hope the finger is healing well. This is stunning, Vicky! Such a brilliant take on the colours and the picture! Love it!